Installing conservatory blinds is a great way to increase the usability of your conservatory all year round. Blinds will help keep your conservatory cooler on summer days, and there is a wide choice of colours and types to suit all tastes and budgets. Conservatory roof blinds are also a cheaper alternative to a complete roof replacement. 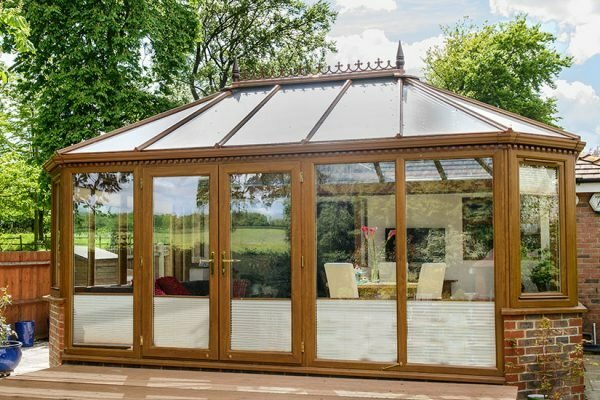 Conservatories are a popular home improvement in the UK, but they can become unbearably hot and bright on summer days. A simple and low cost solution is to install conservatory blinds, which will help keep temperatures cool and reduce glare. Adding blinds will also increase the privacy and security of your conservatory. In this guide, we will explore everything you need to know about conservatory blinds. There is information on prices, types and you can even check how much local installation will cost you. Are you looking to install conservatory blinds, roof blinds or curtains? We can help you find a great deal by comparing local installation prices. To find out how much conservatory or orangery blind installation costs in your area, simply use the cost calculator below. Installing conservatory doors is one of the most affordable home improvements, but exactly how much does it cost to install blinds in a conservatory? Below we will look at the costs of conservatory and orangery blinds, as well as the factors that impact on pricing. Materials – conservatory blinds can be made out of a range of different materials. There can often be a large difference in cost depending on the materials used, with plastic and cheaper fabrics costing less than high end materials. Size – the size of your conservatory will impact the price of installing blinds. Larger conservatories will cost more to install blinds as they require more blinds than smaller conservatories, so material and labour costs will be higher. Location – as with almost all home improvements, the cost of installation is likely to differ in different parts of the UK. Generally, the most expensive prices are found in London and the South of England. Areas that lack local installers will also result in higher installation costs. Roof Type – if you require conservatory roof blinds, the type of roof that you have fitted will influence the cost. Lean to conservatories with rectangular roof panels will cost less than conservatories with triangular panels, such as edwardian and victorian designs. The cost of conservatory window blinds normally ranges from approximately £1,000 to £1,500 for smaller lean to conservatories (3m x 3m), with conservatory roof blinds costing an additional £700. 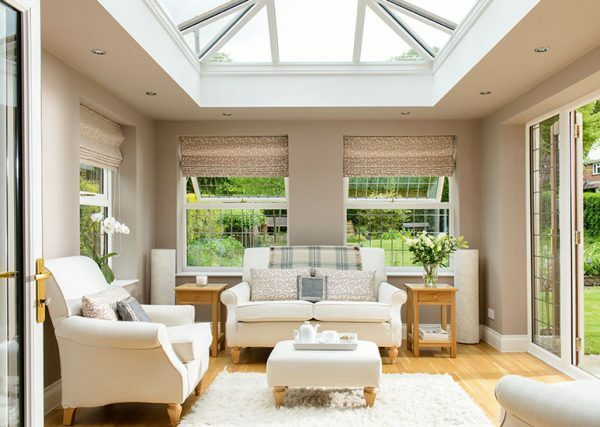 For larger and more complex conservatories, blind installation on the roof and windows will cost upwards of £4,000, including VAT, consultation and installation. If you are an experienced DIY’er, you may want to tackle the installation yourself, and keep costs to a minimum. Check Conservatory Blind Prices from Local Fitters! With prices from as little as £700 and fast installation speeds, window and roof blinds can quickly transform your conservatory into a more usable and livable place. For a low budget home improvement that can quickly transform your home, don’t overlook interior blinds. As well as dedicated manufacturers and installers, many conservatory builders also provide blind installation services. In most cases, dedicated installers will provide a faster install, but it may be cheaper to have your blinds installed at the same time as your conservatory is constructed. In most cases, your installing blinds in a conservatory will only take a few hours. There is very little mess, and some blind options can be installed without screws or drilling, which is great news if you change your mind. Window Blinds – These blinds are used along the windows of a conservatory. They are typically gravity assisted when, and are available in a range of different variations, as we will explore below. As they run vertical along the windows, they are commonly referred to as vertical conservatory blinds. Roof Blinds – Conservatory roof blinds are used on the interior roof panels of a conservatory, and require additional anchoring to hold them in place. They are a cheaper alternative to replacing the roof of a conservatory. Door Blinds – As well as blinds on the windows and roof, you may want to install a conservatory door blind to help control temperature, reduce glare and also increase security. Conservatory door blinds typically require more anchoring than basic window blinds, as they need to remain secure when opening and closing. Pleated Blinds – One of the most popular styles, pleated conservatory blinds provide effective temperature and light control. Specially designed pleated blinds help keep your conservatory cool, whilst allowing light to filter through. They also effectively fold away when not required. Pinoleum Blinds – If you want a blind that will be durable, won’t reduce light and is easy to operate, you shouldn’t overlook pinoleum conservatory blinds. Pinoleum blinds can be installed along the windows and roof of a conservatory and are effective at controlling the temperature within your conservatory. Roman Blinds – These blinds are available in a number of different colours, patterns and styles to suit all tastes and budgets. You can choose a level of light diffusion that suits your preference, from thinner materials that allow light to pass through to blackout fabrics. Duette Blinds – If you want energy efficient and purpose built blinds, don’t overlook duette conservatory blinds. These blinds are available in translucent, opaque and blackout varieties, and are suitable for conservatory doors, windows and roofs. They offer the perfect fit blind for any conservatory. Roller Blinds – Conservatory roller blinds fold away impressively well when not required. Typically, they are gravity controlled, and are not best suited as conservatory roof blinds. They also often sit away from the window, so allow light to pass through easier than other blind options. Venetian Blinds – One of the more common choices, conservatory venetian blinds provide a great deal of flexibility over how much light can or can’t enter your conservatory. However, they differ from other types of conservatory blinds as they don’t diffuse the light, but instead blocks it. Looking for Local Internal Bifold Door Suppliers & Fitters? There are a number of benefits of installing conservatory window and roof blinds. One of the main reason homeowners choose to install conservatory blinds is the improved temperature control. With specialist conservatory roof and window blinds, you can help keep the heat and glare out on hot days, whilst ensuring your conservatory is warm on wintery days. Will conservatory blinds add value to my home? If you interested in a cheap and effective way to improve the usability of your conservatory throughout the year, blinds or curtains can be the perfect solution. They are a popular home improvement for properties with conservatories, and are sure to appeal to potential home buyers. They benefits of increased temperature control, privacy and security make conservatory blinds a fantastic investment. Conservatory roof blinds will typically cost more to purchase and install than similar window blinds. This is because they are more difficult to create and install. It is important to choose the correct type of blind depending on where it will be used, as we will explore below. Is there a difference between conservatory blinds and roof blinds? If are shopping for conservatory roof blinds, it is important to ensure you don’t buy normal conservatory blinds. The main difference between window and roof blinds is that conservatory roof blinds need to be held in place, whilst window blinds can use gravity to align with the window. There are a number of other differences, including the shape. Most conservatory windows will be a standard rectangle, whilst roof panels can be more triangular. Controls for conservatory roof blinds can also differ from those on standard windows. As well as conservatories, specialist blinds are also available for orangeries. 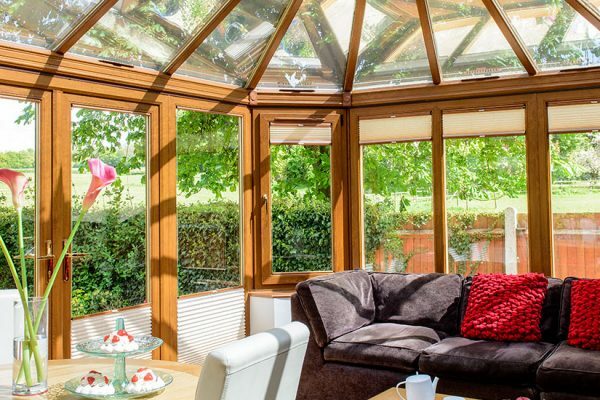 As they are similar to conservatories, and designed to ensure plenty of light can enter, orangeries can become too hot during summer days and the glare can make it hard to see. Fortunately, installing orangery blinds is a cheap and effective solution. Blinds for orangeries are much the same as for conservatories. They are available in a range of different colours and types, with blinds suitable for all budgets. Orangery blinds provide a diffuser, helping to reduce unwanted heat and glare from entering, but still allowing plenty of light to fill your home. 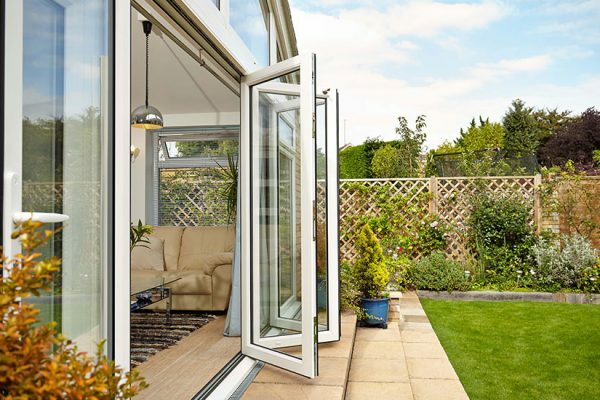 When not needed, they neatly fold away, allowing you to fully enjoy your orangery. Conservatory roof and wall blinds are available in a range of different sizes. In most cases, prefabricated blinds should fit with your window and roof panels. However, bespoke blinds are also available depending on your requirements and sizing. There are many companies who create blinds for conservatory roofs and windows based on your specific requirements. These installers will measure your windows and ensure the perfect fit, and often do not cost much more than prefabricated options. We love helping UK consumers save more on their purchases. To ensure you receive the cheapest supply and fit deals, we have put together some helpful tips and tricks. One of the best ways to ensure you are receiving a great value for money conservatory blind installation is by comparing prices. With our blind price estimator, it only takes a moment to fill in your requirements and work out the best deal for you. Many home improvements can be often be combined to help save consumers money. For example, if you have blinds installed at the same time as your conservatory is installed, the builders will often be able to carry out the work and provide a discount on the blind installation. If you are looking to do a DIY blind installation, you can save big by purchasing your conservatory blinds during a sale. In some cases, savings can be more than 40% off the retail price. Have a look on the social media pages for UK blind suppliers. Promo codes for conservatory blinds installation, really? Yes, you may be surprised that many installers have promo codes and deals that can help you save on the cost of your fitting. We recommend you find local suppliers first, then check to see if they have any discount codes available. Getting a better deal on conservatory window and roof blinds can be as easy as asking for a better price. This is an extremely easy, fast and simple money saving tip. And, it actually works more often than you might think. The home improvement industry is very competitive, and many suppliers and fitters will be willing to provide a further discount to secure your business. If you are an OAP, work in certain industries (armed forces, NHS, etc.) or hold another concession, you may be able to receive a discounted rate from your blinds fitter. Not every supplier will provide discounts, but quite a few smaller installers provide a discount to certain concession holders. Looking for Local Conservatory Blind Suppliers & Fitters? Choosing the right blinds for your conservatory is an important decision. To help provide some inspiration and demonstrate the different blind and curtain options available, we have put together a gallery of images. If you are thinking of installing conservatory blinds, these images will provide some ideas of the different types, so you can choose the right blinds for your home. Below are a few questions our visitors regularly ask about conservatory curtains and blinds. Our answers below will hopefully help you, but if we have missed anything, please get in touch. You will not require any planning permission to add curtains or blinds to your conservatory. Curtains and blind installation throughout your home is outside the scope of planning permission. As such, you do not need any approval to replace or install new blinds. Should I DIY a Conservatory Blind Install? Internal curtains and blinds for conservatories can be purchased from many DIY stores, however there are some considerations that you should consider. Firstly, conservatory blinds generally differ from regular blinds throughout your home, as many are designed to still let light pass through into your conservatory, whilst reducing glare and heat. It is also important to remember that conservatories come in all shapes and sizes, so prefabricated curtains may not fit your conservatory. Conservatory roof blinds can be particularly difficult to install, so unless you are an experienced DIY’er, it may be better left to the experts. If you want to tackle this project yourself, you can opt for an easy fit conservatory blind option, which is easier to install, and often requires little drilling for easier installation. No, you will not need to move out of your home. Installing new blinds within your conservatory will generally take no more than a few hours, and will create minimal disturbance or mess. 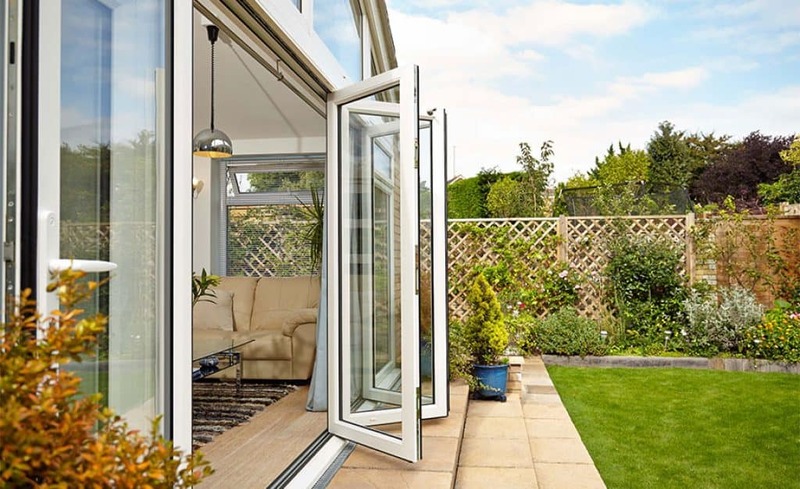 As well as the installation, your chosen supplier will also need to make a quick visit to measure your conservatory and discuss your requirements. There are no qualifications that a conservatory blind installer needs to carry out the work. In order to check the installers performance, you should check their social media pages, reviews and ask for photos of their past work. Most reputable conservatory blind installers will also be a member of an association, such as the British Blind & Shutter Association. If your blind fitter is taking away waste (such as your old blinds), they should have a waste carriers licence. What questions should I ask a potential conservatory blind installer? Asking questions is a great way to better understand potential installers. Below are a few questions that you can ask potential installers to gain a better understanding of their experience and services. How long have you been installing conservatory blinds? Helps keep your conservatory cool in summer. Increases warmth during winter months. The specialist blinds still allows light to enter and fill your home. Increases the usability of your conservatory throughout the year. Can be a very cheap and quick home improvement. May reduce some light entering your home. Reduces the openness of your conservatory. Prefabricated sizes may not fit in your available space, which can increase costs. When you hire a professional to install your conservatory curtains or blinds, they should provide a warranty for their workmanship. In most cases, blind installers in the UK typically offer a warranty between 12 months to 5 years. A warranty will provide peace of mind that if anything was to go wrong, your blinds will be quickly fixed. Whilst there aren’t any specific qualifications that are required for a conservatory blind installation, it is a good idea to always ensure your chosen installer has public liability insurance. This is an insurance that will protect you and your home if something was to go wrong during the building. When you compare bifold door prices or request a quote, you help us raise 50p for an amazing charity. There is no cost to you, and there is no obligation to proceed. Find amazing deals and cost estimates, and help a charity at the same time.